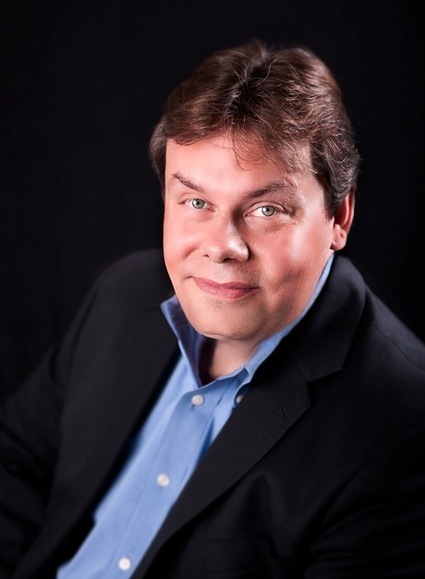 How to Increase the Effectiveness of Your Media Email Pitches Im really looking forward to coming to Anaheim August 1st, to spend time with a group of motivated authors at The Publishing Seminar. This will be a full day packed with actionable information that you can take home and implement right away to kick start your career as an author. My part of the day will focus on showing attendees my firms specific strategies that we have used to land our self published authors on leading media outlets including Good Morning America, The Rachael Ray Show, CNN, Fox and Friends, Sirius/XM, Mancow, and even international outlets like The Today Show Australia, Univision and Canadian Network Television. One question most self published authors want to know is if they can really get the medias attention, especially when they are competing with books from traditional publishers who employ well-connected in-house publicists. As a longtime working member of the media who has spent three decades on the air and behind the scenes with major broadcasters, I can tell you that those inside connections only get you so far. What REALLY excites a media pro and makes them want to book you for an interview or coverage is when you pitch them an idea or angle that they believe will be interesting and relevant to their target audience. And one of the biggest complaints youll hear from most media folks, including producers, air personalities and reporters, is the amount of poorly written, incorrectly targeted and basically worthless pitches that litter their email boxes. Yet many times when TV, radio, print and online outlets contact Allen Media Strategies to book one of our clients and we ask how they heard about the client, they usually reply, We received your email. Why do our email pitches seem to grab the medias attention and cause them to contact us to book our clients? What are some of the strategies we use to increase the chances of our email pitches being read, and acted upon? 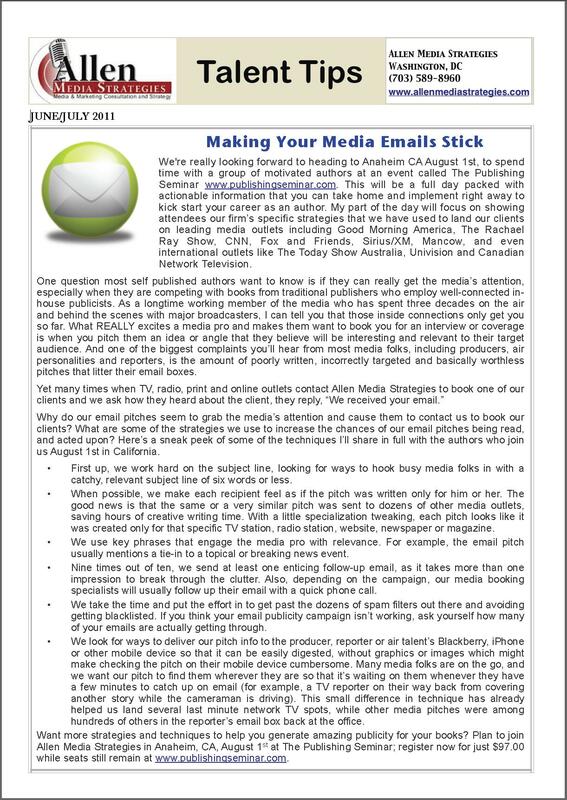 Heres a sneak peek of some of the techniques Ill share in full with the authors who join us August 1st at The Publishing Seminar in Anaheim, CA: First up, we work hard on the subject line, looking for ways to hook busy media folks in with a catchy, relevant subject line of six words or less. When possible, we make each recipient feel as if the pitch was written only for him or her when, in fact, the same or similar pitch was sent to dozens of other media outlets. With a little specialization tweaking, the pitch looks like it was created only for a specific TV station, radio station, website, newspaper or magazine. We use key phrases that engage the media pro with relevance. For example, the email pitch usually mentions a tie-in to a topical or breaking news event. Nine times out of ten, we send at least one enticing follow-up email, as it takes more than one impression to break through the clutter. How many times have you followed up, with no success? Depending on the campaign, our media booking specialists will usually follow up their email with a quick phone call. We take the time and put the effort in to get past the dozens of spam filters out there and avoiding getting blacklisted. If you think your email publicity campaign isnt working, ask yourself how many of your emails are actually getting through. We look for ways to deliver our pitch info to the producer, reporter or air talents Blackberry, iPhone or Treo so that it can be easily digested, without graphics or images which might make checking the pitch on their mobile device cumbersome. Most media folks are on the go, and we want our pitch to find them wherever they are so that its waiting on them whenever they have a few minutes to catch up on email. For example, a TV reporter on their way back from covering another story while the cameraman is driving. This has already helped us land several network TV spots, while other companies pitches were among hundreds of others in the reporters email box back at the office. Want more strategies and techniques to help you generate amazing publicity for your books? Plan to join me in Anaheim, CA, August 1st at The Publishing Seminar; register now while seats still remain at www.publishingseminar.com. Heres to your success!